Marine gear that is built to last. For over 50 years, our friends at Mustang Survival have been in the business of designing products to help you enjoy your time on the water, and their Bluewater Gear Hauler is a perfect example of this. It’s filled with well-thought-out features. 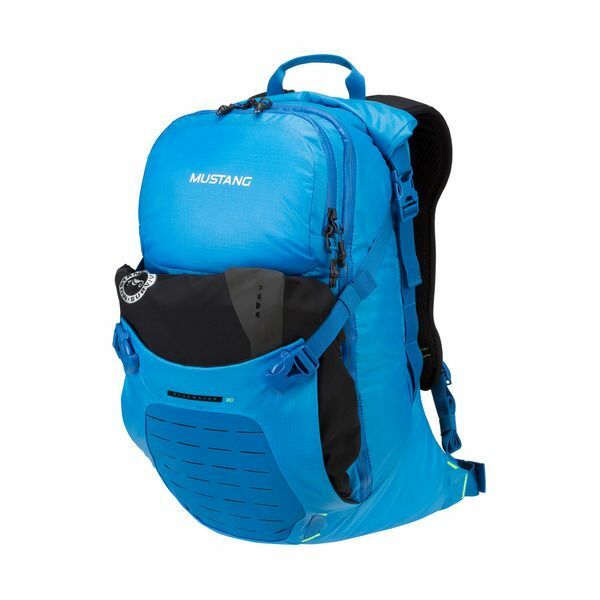 Starting with the 30 liter carrying capacity, it has a huge main compartment with a full-access zipper and 3 interior, mesh, zippered organizational pockets. There’s also a large roll top, waterproof compartment that will ensure your laptop and other electronics won’t see any water. A smaller external pocket has a key ring clip and several stash compartments for keeping those little items like lip balm, hand sanitizer, energy bars, etc. well organized. There’s a handy MOLLE panel on the front that can expand to hold your towel or wet or dirty gear that you want to keep separate from your main compartments. It should also be noted that the pack is designed out of a strong, waterproof material that looks like it will hold up well to years of use, and all zippers are urethane-coated so there won’t be any water seepage at these points. The straps are well padded and comfortable, and the back panel is also padded and features a ventilation system designed to keep you cool. The Mustang Survival Bluewater Gear Hauler is an impressive pack for use in, on, and around the water as well as on land-based activities or when you need some extra protection in wet environments.